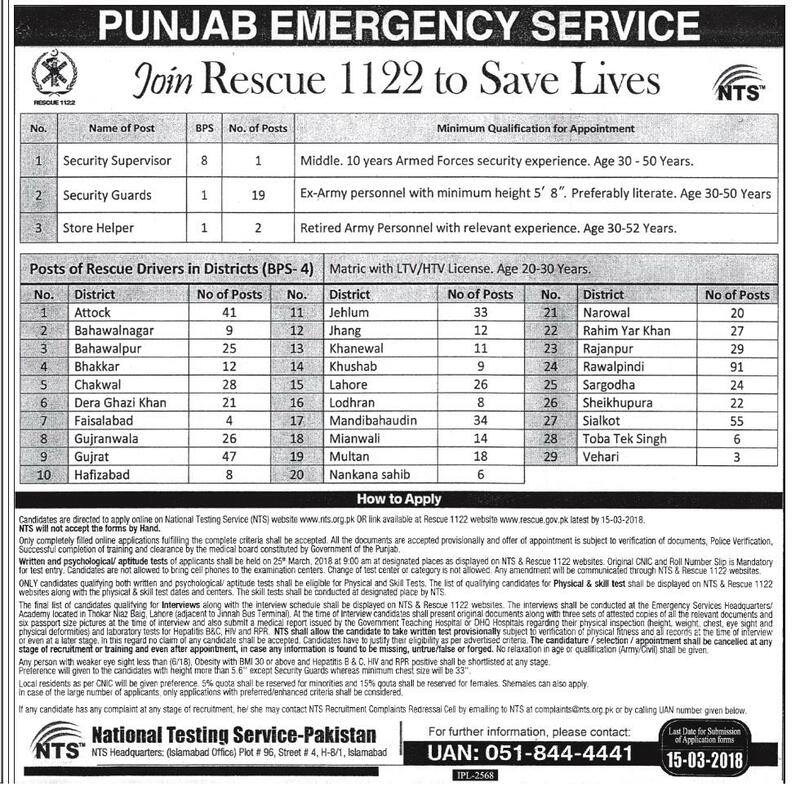 Government of Punjab has announced 691 New Jobs Punjab Emergency Service Rescue 1122. These Jobs are announced in Daily Jang Newspaper 28th February 2018. Join Rescue and Save Lives by applying for Rescue 1122 Jobs 2018 as for Driver 669 Posts, Security Supervisor 01 Post, Security Guard 19 Posts ad Store Helper 02 Posts. These Jobs are announced For Rescue 1122 Head Quarters 29 District of Punjab. Recruitment Process will be Process through National Testing Service (NTS). Candidates who have passion to serve Humanity can apply for Life saving & one of the Respected Department in Punjab as well as in Pakistan. Candidates applying for these jobs should be physically fit and Active as Rescue 1122 Conduct as Physical Test during Recruitment process. Disables Candidates are not allowed to apply. Qualification Matric, Middle, Retired Army Personnel, Ex-Army Personnel.